This beautiful fifteen year-old girl will love you the moment she meets you, but her syndrome is as complicated as any math problem you will encounter. However, unlike the math problems that have very distinct answers this syndrome doesn’t have answers that always work. Her name is Cami (Camille Grundy) and she is our daughter who was born with Prader-Willi syndrome or PWS. PWS is caused by an absence of a piece of genetic material on chromosome 15 that affects one in every 12,000 – 15,000 births. There was nothing we could do to prevent this and there is no cure. PWS affects the hypothalamus region of the brain which is responsible for appetite, growth, temperature regulation, and metabolic rate thus causing a person with PWS to have uncontrollable hunger, low muscle tone, high risk for obesity, short stature and higher than normal body temperatures. Camille experiences all of these and we have to take preventative actions daily. Such actions have or do include include giving her a daily shot of growth hormone to help her to grow and increase muscle tone, monitoring her body temperature, having her do regular exercises at home and school and most importantly trying really hard to limit her to 1,000 calories per day. Monitoring how much food she eats and eliminating the opportunities for her to get food are a daily challenge. The uncontrollable hunger that Cami and individuals with PWS feel all the time will cause them to forage for food and do almost anything to get their hands on it. There have been times when we woke up in the morning to find our daughter in bed with empty plates and containers from leftovers that had been thrown in the trash, which we had forgotten to lock the night before. Yes, we have to lock our refrigerator, food pantry, trash, and anything with any type of eatables otherwise her compulsion will cause her to eat it all. We can only describe the feelings we have when this happens as a monster that pours out of us coating us with sadness and fatigue. We have to constantly remind ourselves that it is not her fault. We have had our kitchen framed in with a locking door so that Cami cannot get into the kitchen at night to forage for food. Prader-Willi syndrome affects all races in both males and females. Other complications of PWS include but are not limited to delayed development physically, mentally, and emotionally, obsessive compulsive disorder, daily tantrums, severe anxiety, skin picking, attention deficit, etc. The last few years at school have been complicated as we have watched Cami’s behavior turn into daily tantrums with spikes of rage that seem out of her control. As you can imagine, her classmates, who love her dearly, have come to be afraid of her. This, coupled with her paranoia, has made teaching and learning very difficult and challenging. Very often after such episodes there is extreme remorse and guilt felt by those with PWS and after getting through it they are ready to get back to the task at hand. In 2009 we had come to our wits end so we made a call to PWSA USA to get some advice and help. Through the tears and anguish in our hearts we began to explain what we were dealing with Camille. We got more than we could have imagined when speaking to the kind people at PWSA USA. Evan Farrar and the team there were so supportive and encouraging. They introduced us to Mary K Ziccardi who has been our educational consultant, sounding board and most importantly friend. Mary K introduced us to The Children’s Institute in Pittsburgh, PA, which helps children and adults with Prader-Willi syndrome. Many of the people there are extremely over weight and are experiencing severe behavioral challenges. Cami spent two months there from December 27 2011 – February 28 2012. The day we left her there was one of the hardest days of our lives. (We live 10 hours away). Cami is only 4’5’’ and her weight had risen to 118 pounds. While there she was placed on a strict diet of 800 calories per day. She was also placed on a daily exercise routine. She was taught strategies on how to deal with how she was feeling and how to process her behaviors. Cami’s behaviors were strictly monitored and she was put on medications to help with those behaviors. We are eternally grateful to The Children’s Institiute and particularly Ken Smith (admissions director at the time and now Executive Director at PWSA USA) and Dr. Cherpes (physiatrist) as well as all the nurses, dieticians, teachers, therapist and staff who helped us while Cami was there. Camille’s stay at The Children’s Institute was a game changer for her and our family. While at The Children’s Institute we found out that Cami had extreme scoliosis. The staff a TCI suggested we call Dr. Van Bosse at Shriner’s Hospital in Philadelphia who treats children who have PWS and live with severe scoliosis. We took that suggestion and began that journey. After a year of visits to and from Philadelphia Cami had her spinal fusion July 26, 2013. Our family is eternally grateful for the care that our precious daughter received from Dr. Van Bosse (surgeon), Marcia (nurse practitioner) and the many other nurses and staff who helped Cami during her stay there. Cami made the transition to high school this year and is a freshman at Fitch Senior High. The best educational model for Cami is to be in the same room for most of the day. We are eternally grateful for the wonderful team that works with Cami at the school. Her teacher, Mrs. Powell goes far and beyond what would be expected. Her love for Cami shines through brightly. Cami is also blessed to have a wonderful aide, Mrs. Lamb who helps Cami navigate through her day and is there to care for, look after, and help teach Cami. There are days at school that the challenges that come along with PWS are difficult to deal with but the school staff at Fitch High have done a great job in taking the steps necessary to understand PWS and how to handle Cami in both the good and more difficult times during the day. We are thankful for the many people in the Groton School system that have taken interest in Cami both educationally and personally and who have constantly displayed that they want nothing but the best for our daughter. Over the last two years we have maintained the diet (1000 calories) and exercise routine that Cami started at The Children’s Institute. In 2012 she lost 45 pounds and had maintained her weight at 75 pounds. In fact we recently bought her first pair of skinny jeans – A SIZE ZERO!! Our support system is most certainly a blessing and one that we are eternally grateful for. Camille has two great brothers, Cody (age 17) and Cavan (age 8) who play with her, read to her and exhibit a great deal of patience with her. Cody would tell you that it is not easy and you have to take your time with her but when you do you will see the loveable side of Cami. Cami has very special grandparents especially her paternal grandmother, Sharon, who gets her ready for school every day, goes on field trips with her, picks her up from school when she is sick and is always there to help whenever needed. We are also thankful to our close friends and church family who have offered support, encouragement, prayers, babysitting, and financial assistance. The past two years have also ushered in a great deal of opportunities for Cami. 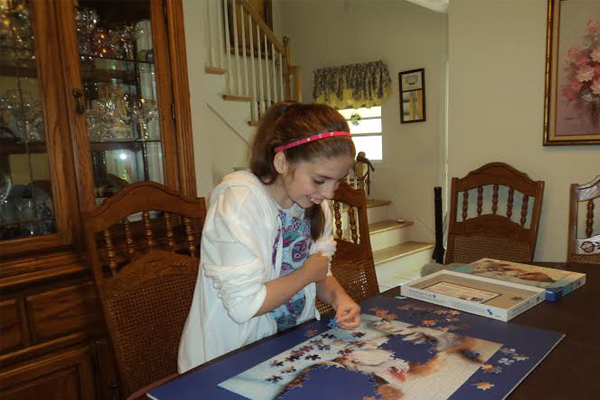 She attends Camp Horizons a special needs camp located in South Windam, CT about 40 minutes from our home. What a blessing the staff there has been to Cami and our family. Cami has also joined the Special Olympics team with the Town of Groton, CT (our home town). She competes in Track and Field and has become one of the top 800-meter walkers for age division knocking two minutes off of her time over the two years. Because of great care Cami has been given we want to give back some. Cami is going to be taking part this week in the first ever swallow study on people with Prader-Willi syndrome. Dr. Gross and Dr. Cherpes at The Children’s Institute are conducting this study. This will be Cami’s first visit back since she left. She can’t wait for the doctors and staff to see her and how much weight she had lost. We have been blessed with a very special daughter who has opened our eyes and hearts to people we would have never experienced and had the pleasure of getting to know had she not had PWS. Cami absolutely loves everyone she meets and almost always greets them with a smile and huge hug, even strangers. She love animals, especially dogs, and can remember an animal’s name even if she hasn’t seen it in years. Camille is very drawn to people that most of us would not automatically be drawn to. She cares for those who are physically and emotionally hurting and is always ready to offer a “Cami” hug and a warm smile. In this world of intolerance Cami has shown us what it means to be tolerant and accepting, and that it is alright to talk to strangers in wheelchairs or to those who “look different.” She also regularly reminds us to pray for these people. Thanks for taking the time to learn a little about our precious daughter Camille and Prader-Willi syndrome. There are so many more layers to Cami’s story that are challenging, exhausting, inspiring and uplifting. If you would like to know more please call us at (860)334-2095 To learn more specifically about Prader-Willi syndrome then please visit www.pwsausa.org.